Meet The Press is preempted by the Olympics again, so I decided to twist the dial (wait, what’s a dial?) over to Fox News Sunday this morning. The program is not as old as Meet The Press (65 years and counting), but it has been around for more than 15 years, and Chris Wallace has been the host since 2003. The program opened with David Axelrod, a top member of the campaign to re-elect President Barack Obama. Wallace was very direct in his questions about the economy and the disappointing jobs report. Wallace noted that the president had spoken of a “recovery summer” back in 2010 which did not materialize. Axelrod was able to use almost every question as a way to contrast the Obama economic plan with that of Republican challenger Governor Mitt Romney (R-MA). Wallace had a tough question about President Obama’s proposal to keep the Bush era tax cuts for those making less than $250,000 a year and allow the cuts to expire for those making more. He played a clip of the president in 2010 saying that, given the fragile state of the recovery, we should keep all of those tax cuts alive. Back then, Wallace noted, economic growth was 2.3% compared to only 1.5% now. So if the recovery is now even more fragile, why is this the time to split up those tax cuts? Axelrod responded that there is no evidence those top level tax cuts are stimulative for the economy. Wallace interrupted to say that was not the point of the question. Axelrod repeated a variation on his earlier point, the president does not believe high end tax cuts are important to economic growth. There was a fun “lightening round” where Wallace tried to get Axelrod to give quick, short answers to a series of questions. The segment didn’t really work, but it was entertaining. There were some real fireworks during a discussion of voting periods in Ohio, although neither Axelrod nor Wallace explained the issue well. 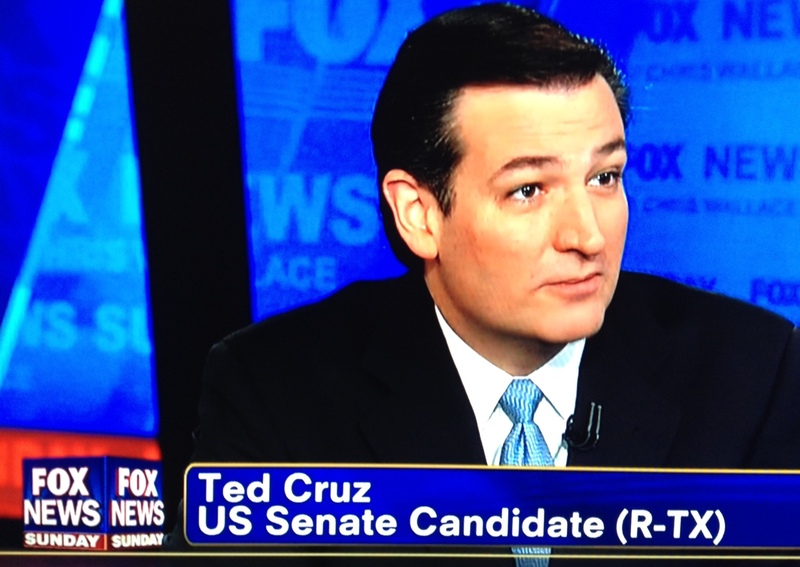 Next up was Ted Cruz, the Tea Party supported winner of the Texas Republican Senate primary. Cruz turned out to be a more engaging candidate than I expected. The Cuban-American holds all the usual Tea Party positions: abolish several federal agencies including the IRS, TSA, Commerce, Energy, and Education departments; implement a flat tax; etc. As a teenager, Cruz travelled around the state giving speeches on conservative values and the Constitution and even memorized big sections of the document. It is also worth noting, however, that he graduated from Harvard Law and Princeton, served as a law clerk for Chief Justice William Rehnquist, became director of policy planning for the Federal Trade Commission, and then was the solicitor general of Texas. Wallace pushed Cruz on his ability to work with Democrats to solve problems (in other words, compromise). Cruz said he could compromise, but he ultimately backed away from the one thing which will be key to compromise: raising revenue. Later, Cruz assured viewers that the grassroots base of the Republican Party will turn out to vote for Mitt Romney. In the roundtable discussion, I am always looking for something that goes against the conventional wisdom, an intriguing prediction, or even a nice turn of phrase. I am usually disappointed, and today was no real exception. Democratic strategist Joe Trippi had a good line when he said that on the tax return controversy, Senate Majority Leader Harry Reid yelled “Smoke!,” and the Romney campaign responded by yelling “Fire!” Republican strategists Ed Rollins joined a small but growing number in his party calling on the Romney campaign to release more of tax returns. He says 5 or 6 years worth should be adequate. Speaking of Rollins, he wore a five-mile stare throughout the roundtable discussion. He rarely looked directly at Wallace, the other panelists, or the camera. And he spoke in very short sentences, rarely elaborating on his thoughts. Very odd. A regular feature of Fox News Sunday is their “Power Player of the Week.” I don’t know if all the people featured here are non-political, but today’s profile of Dr. Suzan Murray, the chief veterinary at the National Zoo was fascinating and charming… well worth watching if you can find it online. More information on Fox News Sunday, including transcripts, is available here. Next week, Meet The Press (and my notes on the broadcast) returns.